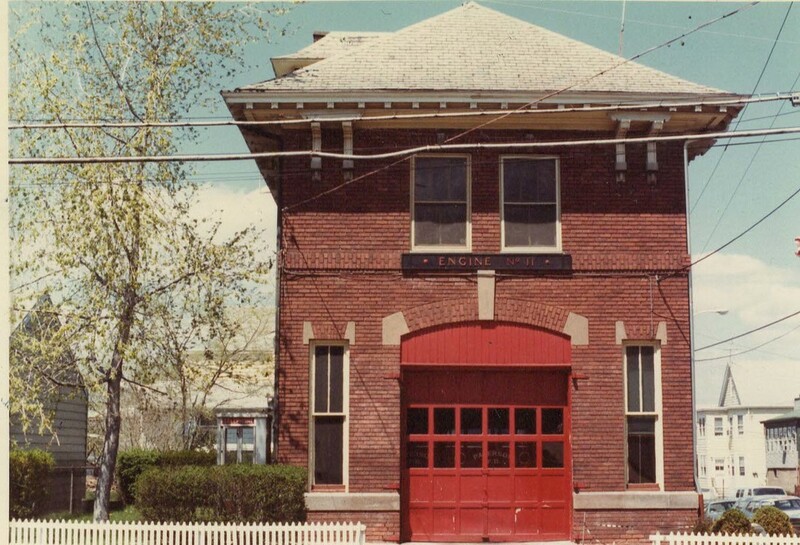 ​ March 18, 1912: The Firehouse at 97 Grand Street (corner of Quinn Street) opened less than one month after the Titanic sank on April 15, 1912. 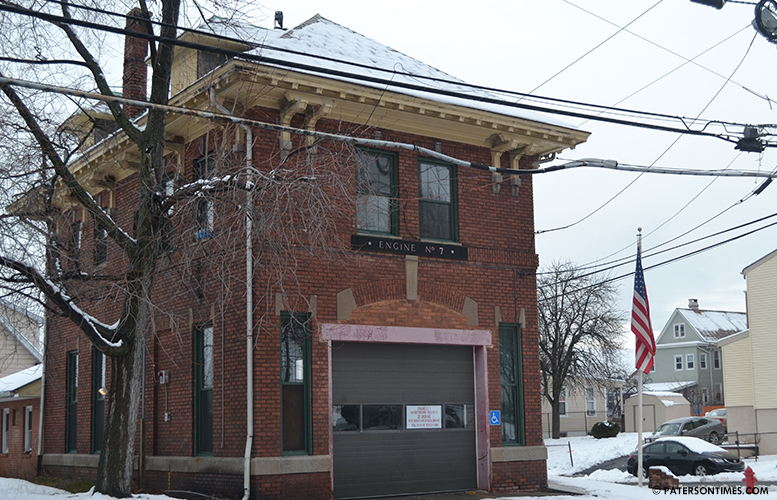 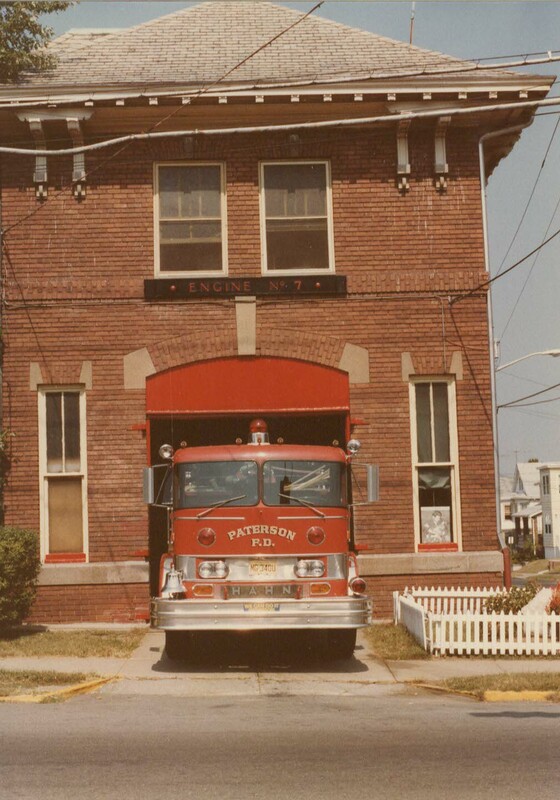 Engine Company 11 relocated to this house from its 10 Hotel Street quarters. 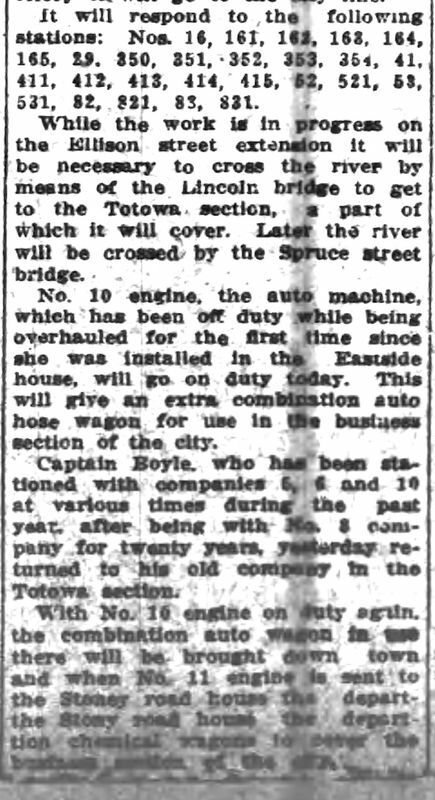 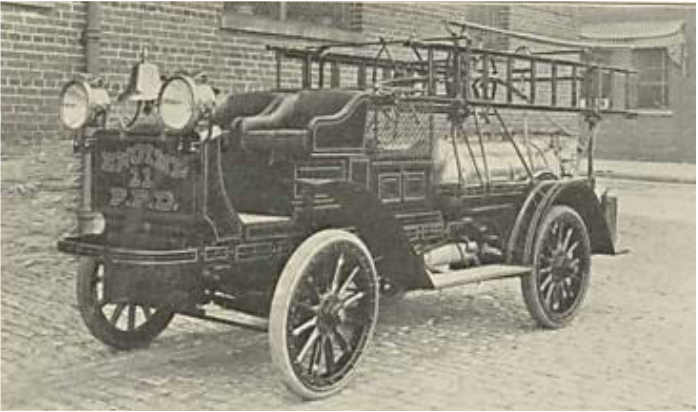 March 18, 1912: Used the Autocar Automobile the company had in the Hotel Street location. 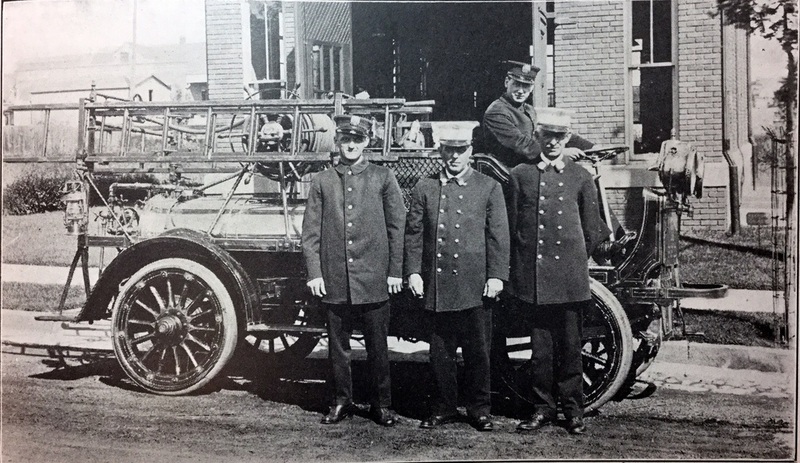 Left to right: Captain John Crowley, John Walsh, James Brady and Lieutenant Thomas Hunt in front of their motorized chemical wagon. 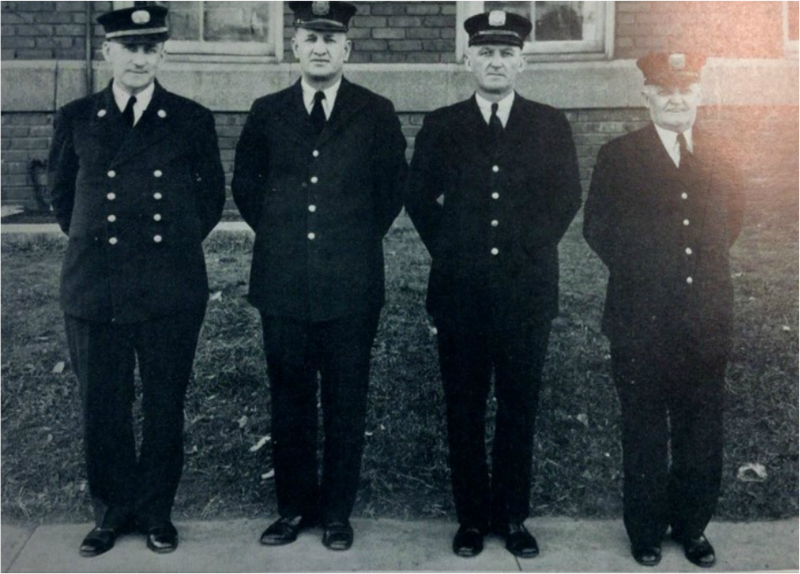 If you blow up the photo and look closely at the hat badges you will see the officer on the far right has a single horizontal trumpet: that is a lieutenants' hat badge: he is Thomas Hunt. 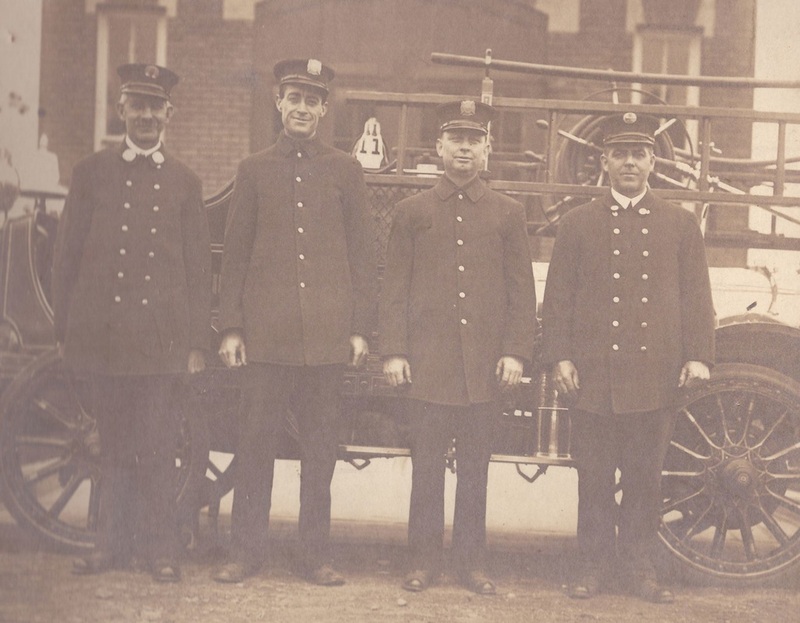 The Captain (John Crowley) at the far left has two vertical trumpets on his cap badge. 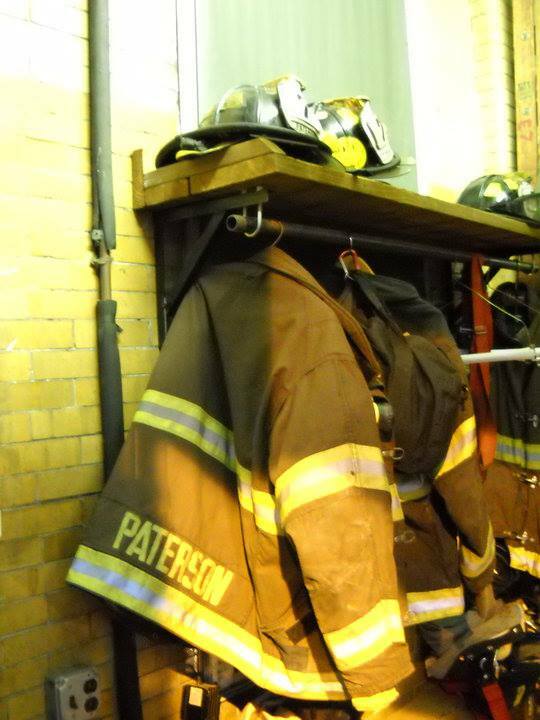 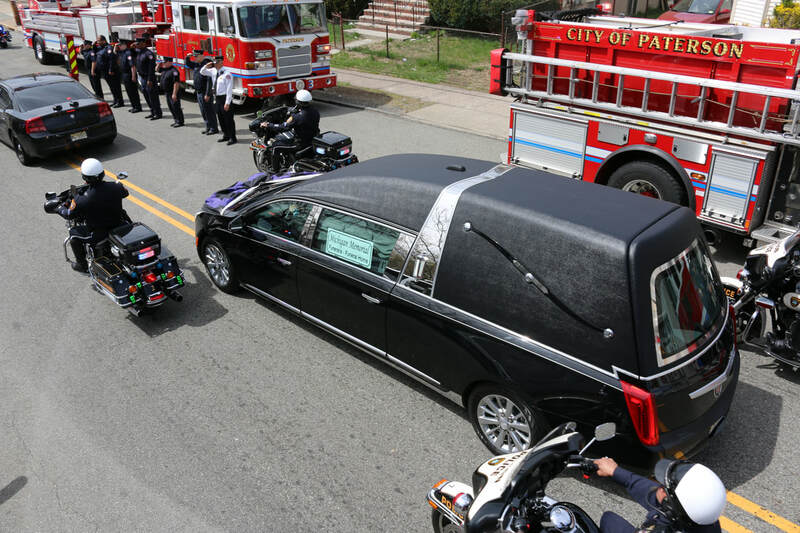 The firefighters (Walsh and Brady) have Maltese cross PFD badges on their caps. 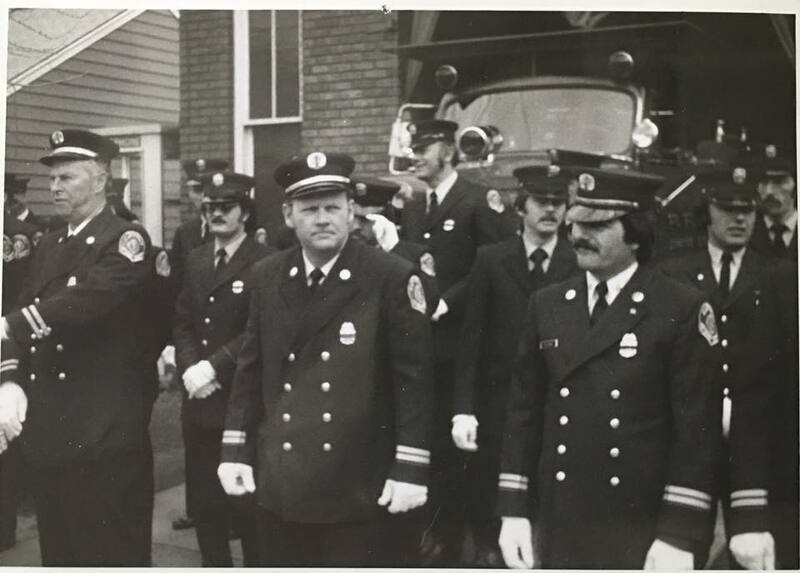 Note also that the two firefighters (non-officers) in the middle have a single row of coat buttons whereas the two officers (Captain on the left and Lieutenant on the right) have a double row of buttons. 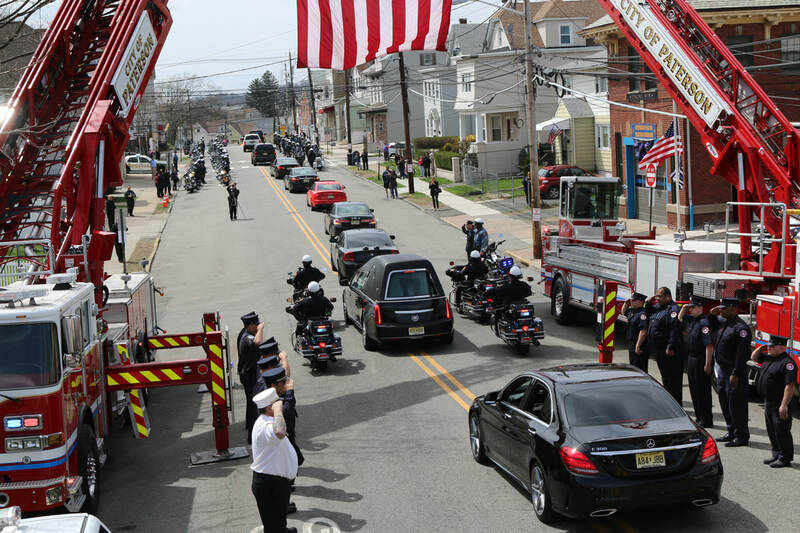 Also the Captains lapel pins are larger than the lieutenants. 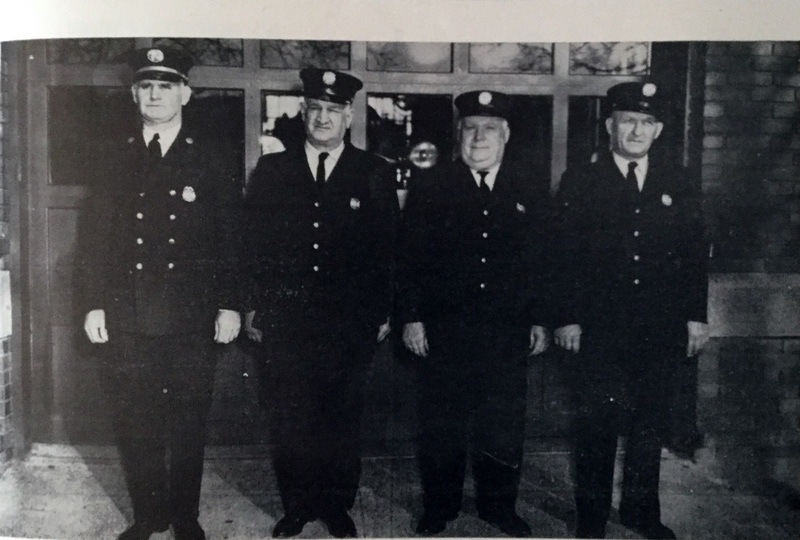 The two firefighters have no lapel pins. 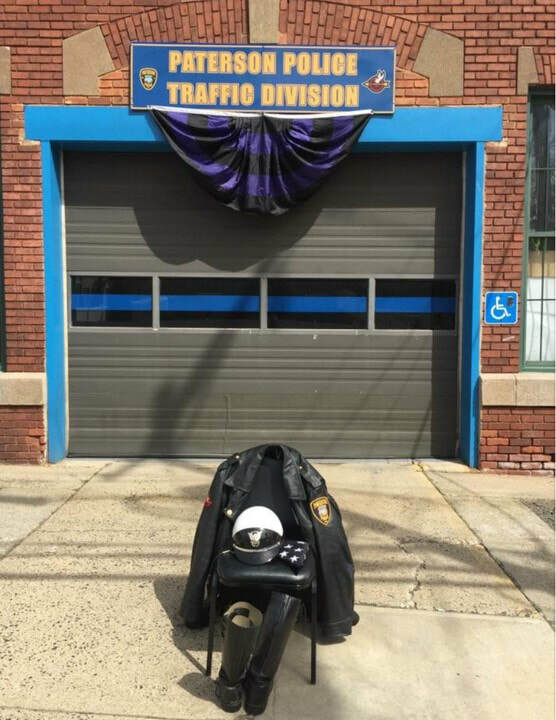 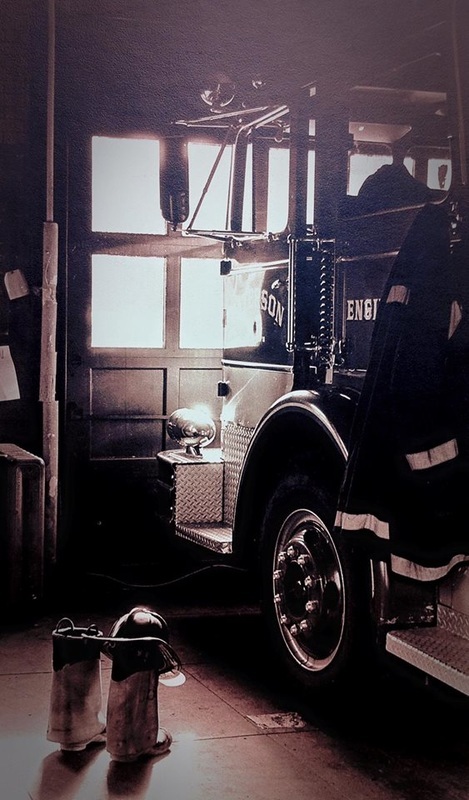 Also seen on the apparatus is the E11 helmet with a white shield with 2 vertical trumpets at its tip, belonging to the Captain. 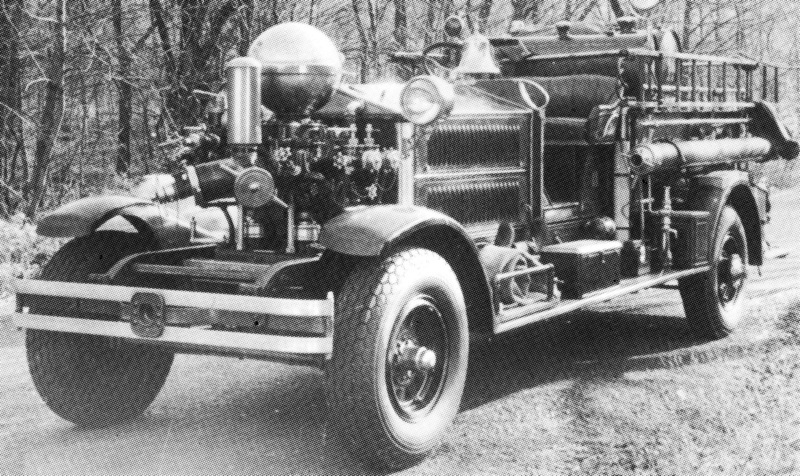 January 1935: Ball Booster Program: Captain Edward Cusack Sr.
​November 30, 1932: 1922 chain-driven second size American LaFrance Triple Combination Hose and Pumping Engine (500 GPM), Serial # 5030) acquired from Haledon NJ Fire department: this apparatus had been severely damage, in an accident. 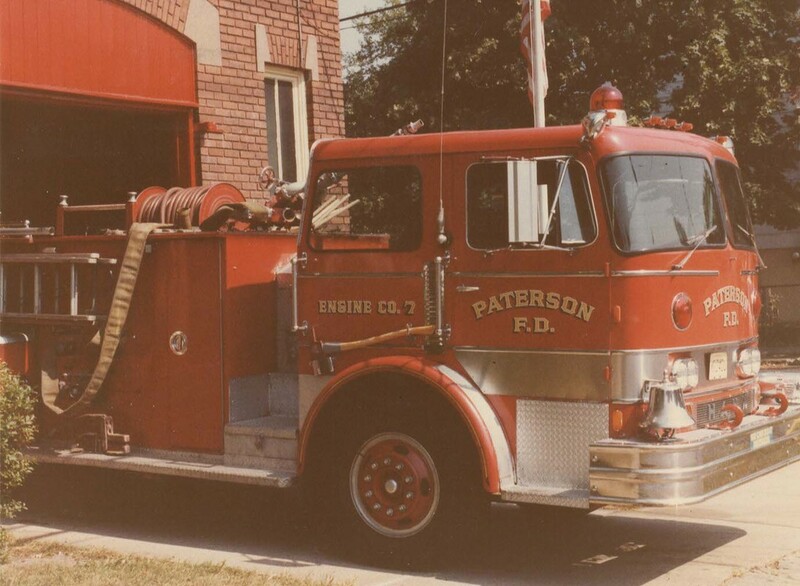 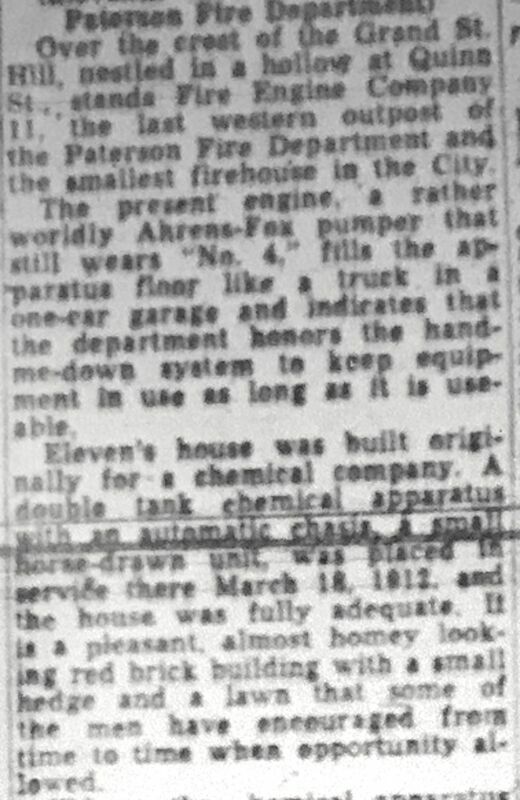 The Ahrens Fox representative had it repaired and gifted it to Paterson. 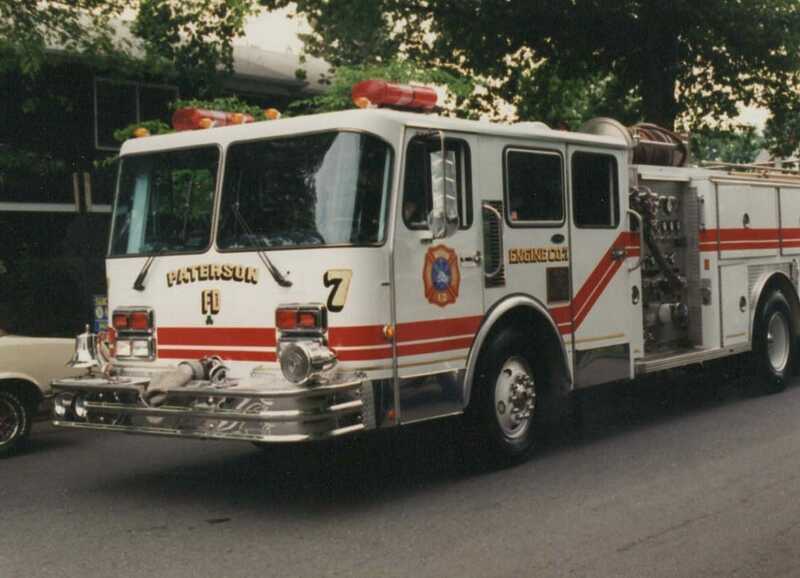 In PFD records this is referred to as either a type 12 or type 75 model. 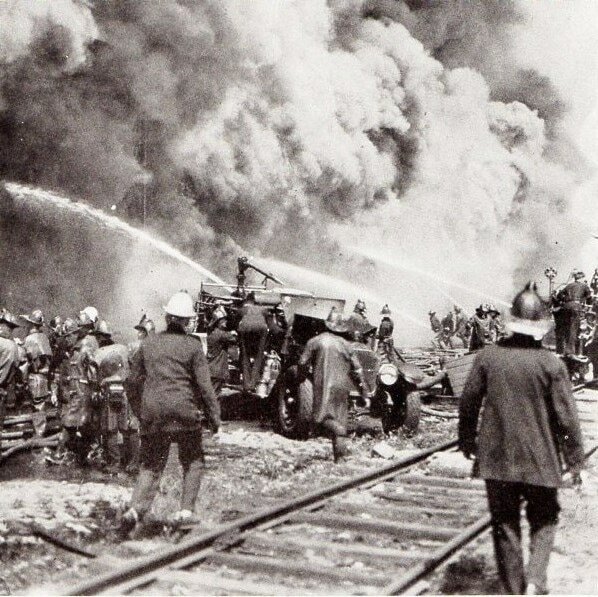 The apparatus is seen in this 1942 fire scene photo. 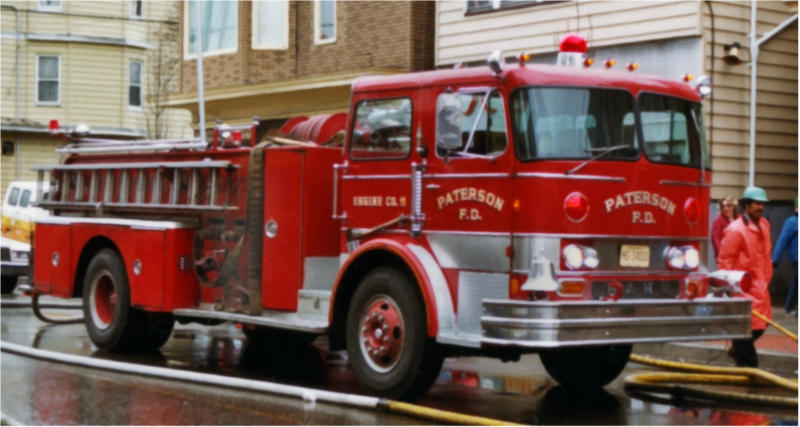 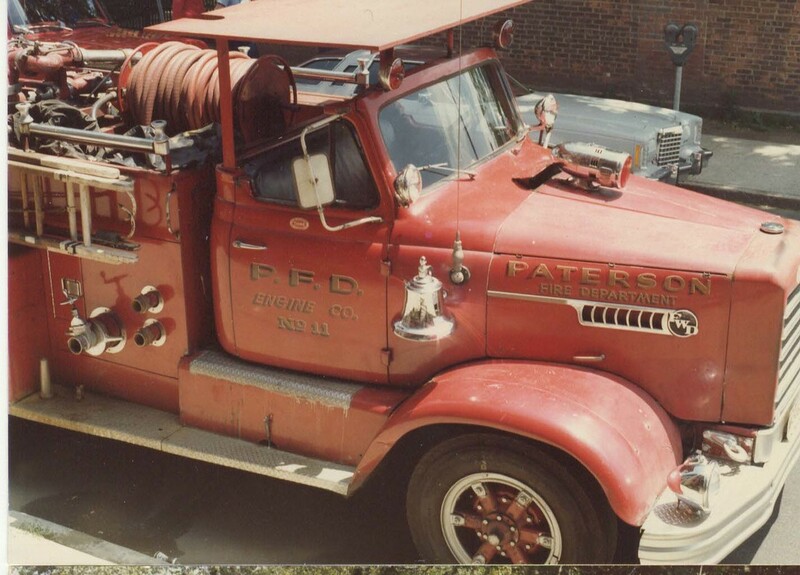 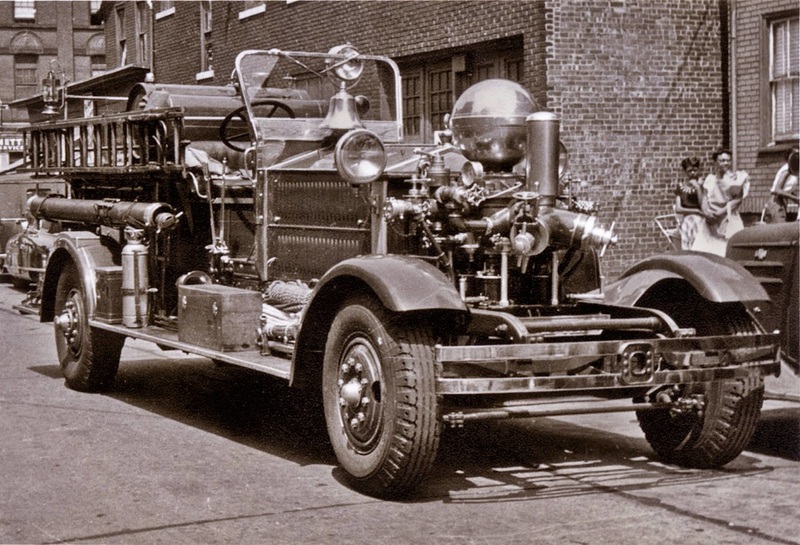 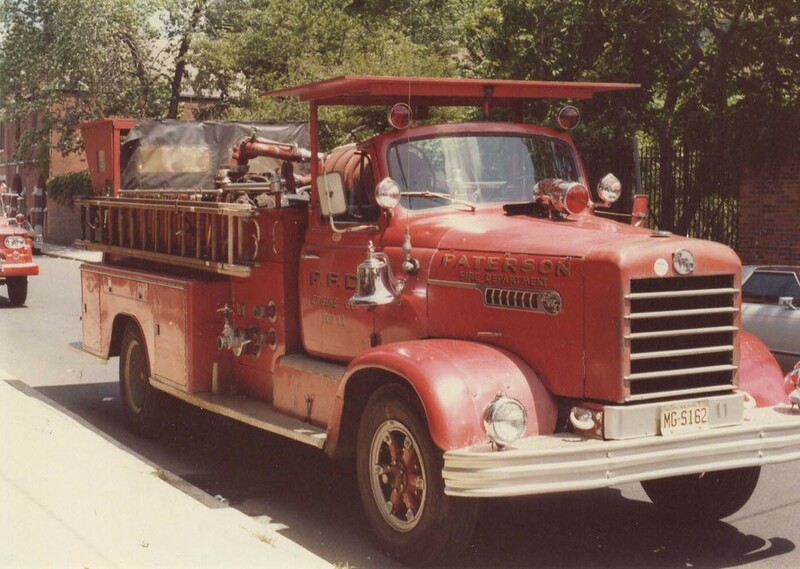 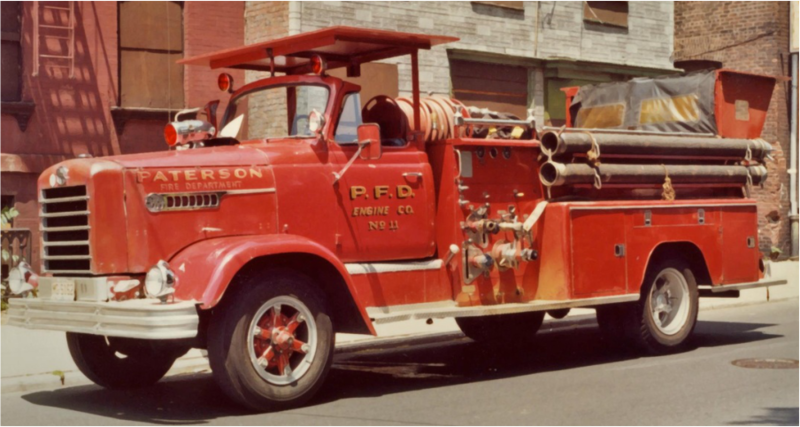 ​March 1953: 1930 Ahrens Fox Model H-P-4 1000 GPM pumper (Serial #2312) formerly used by Engine Companies 1 and 4. 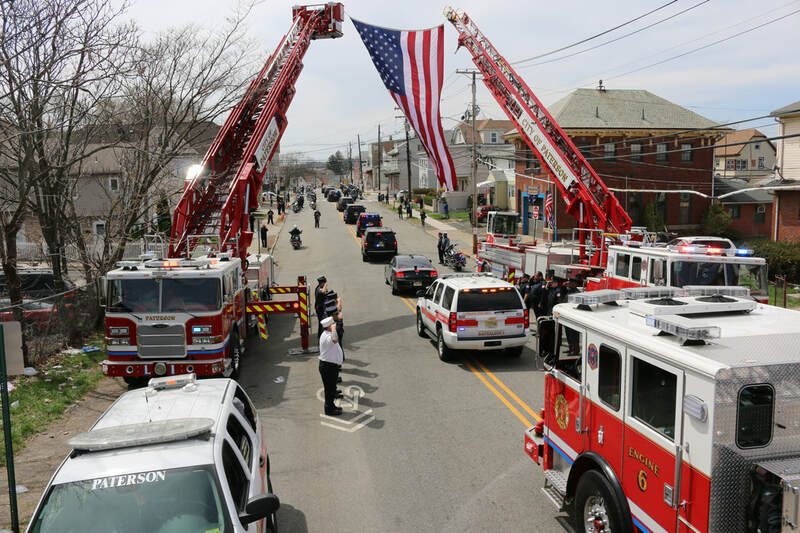 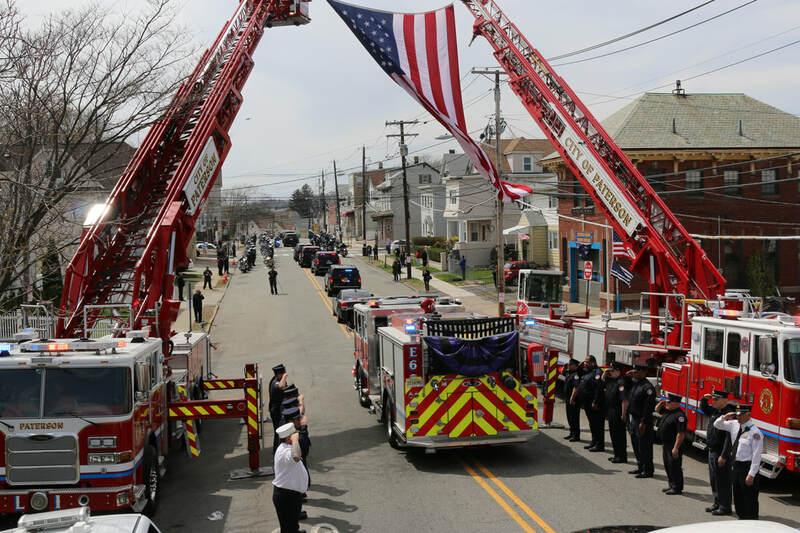 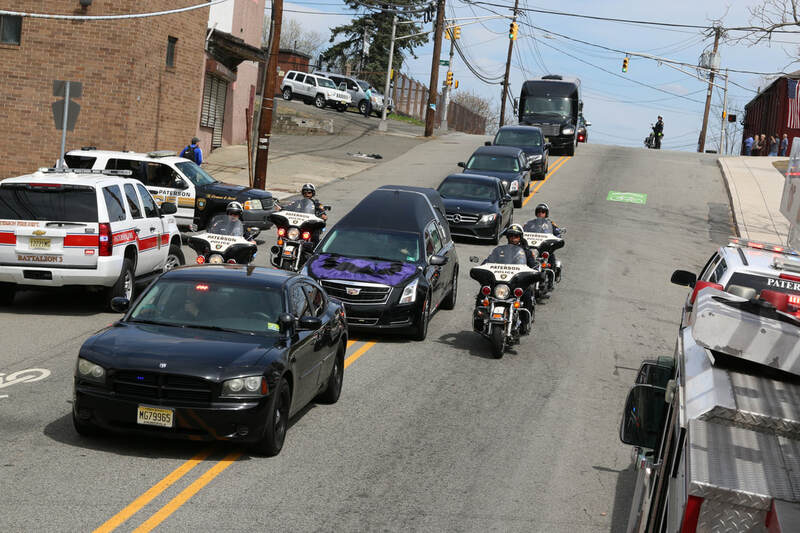 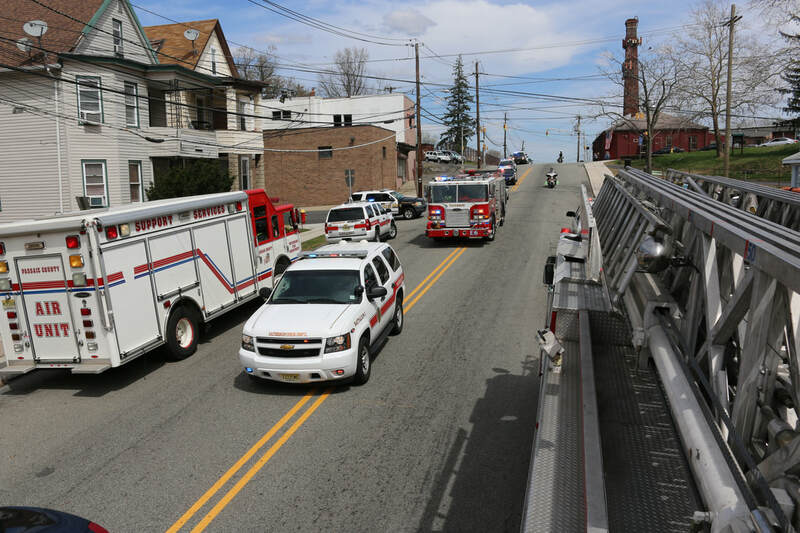 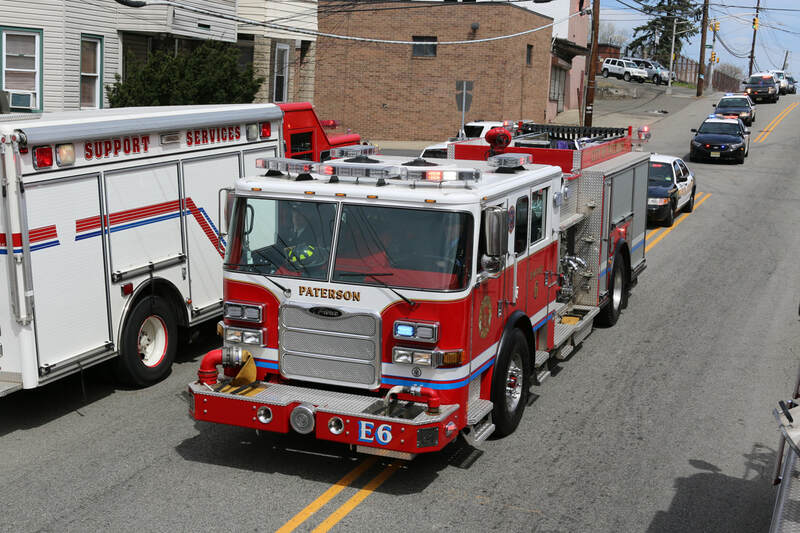 Photo below is as Engine Company 4. 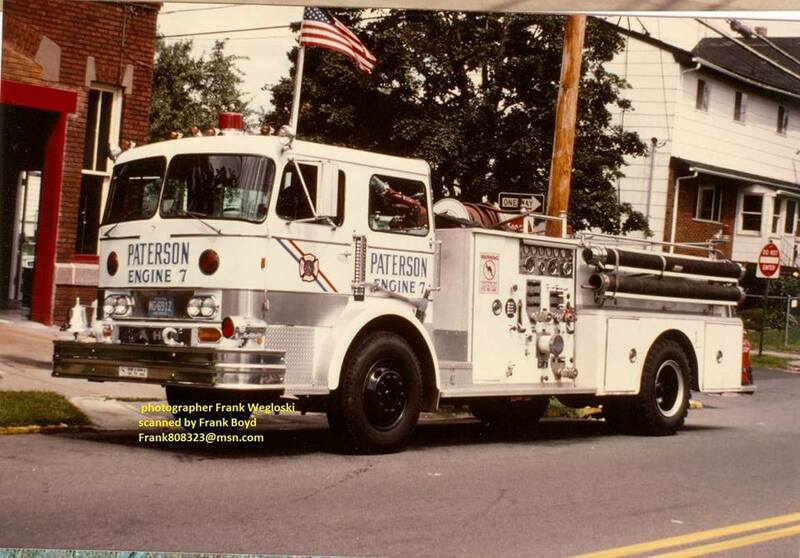 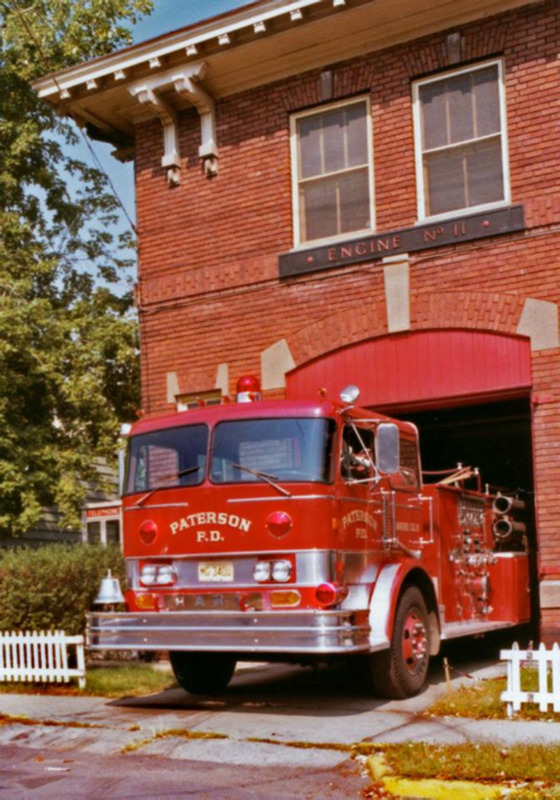 This apparatus was retired in March 1958 and sat in a field in West Milford NJ before being sold in 1961 to Community Fire Company of Wayne, NJ where it was restored. 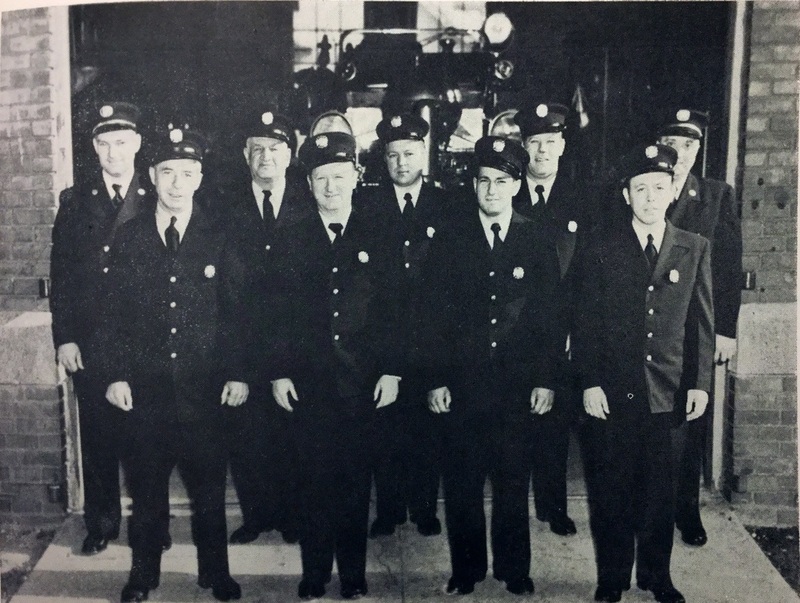 September 18, 1953: ENGINE COMPANY 11 - From the Morning Call Series of PFD Companies. 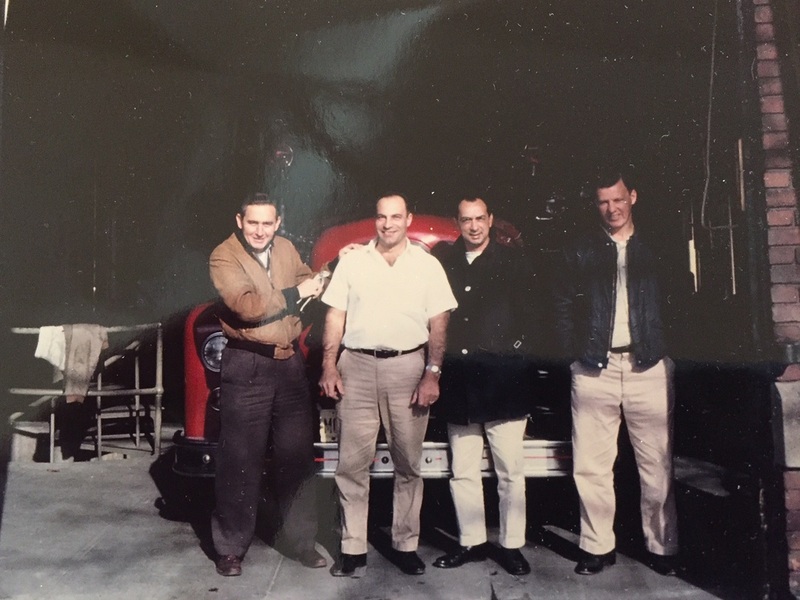 Front row L-R: Roger Brosnan, George Reid, Jack Nargiso, Joseph Raneiri. 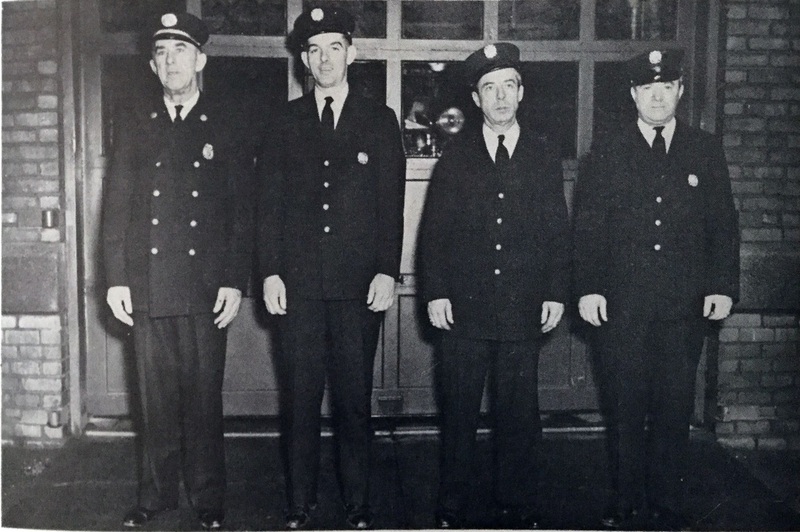 Rear row L-R: Captain George Findlow, John Dougherty, John Cichon, George Kilgour, Captain Elia D'Addario. 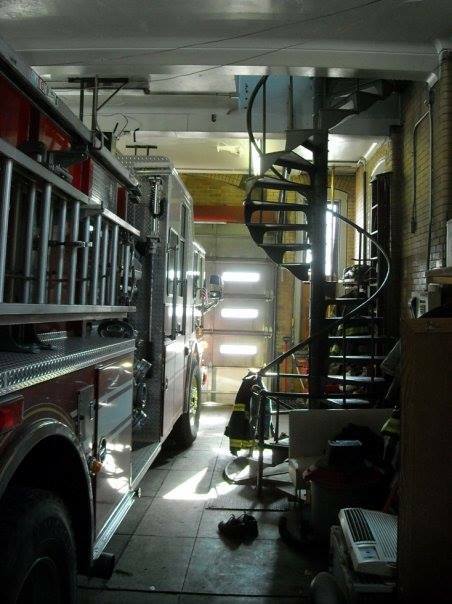 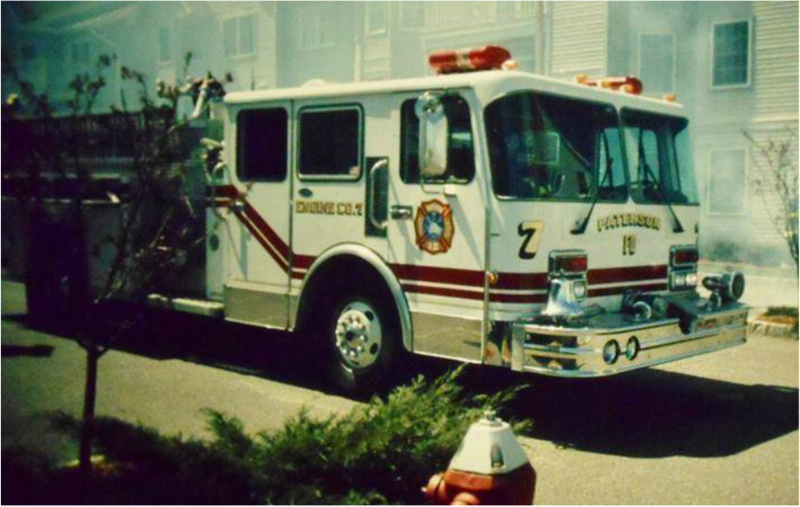 The Ahrens Fox pumper (originally E1 and E4) is in the background. 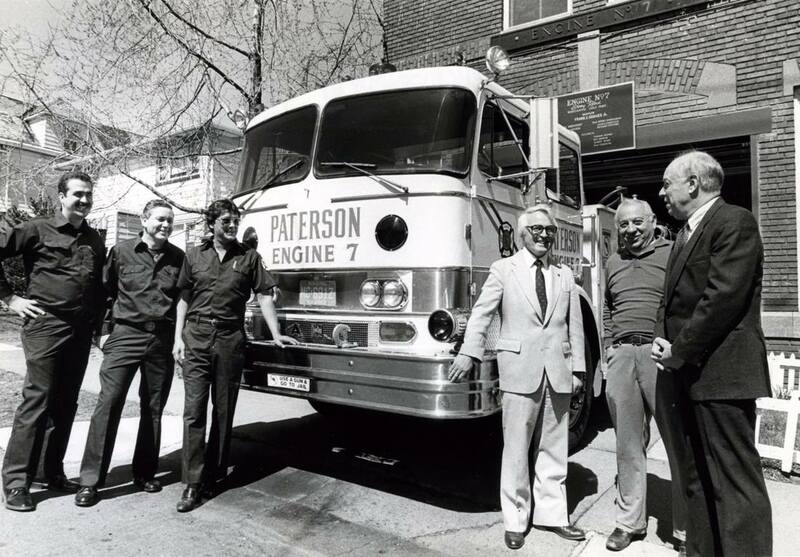 1967: Men of Engine Company 11 with 1953 Seagrave: Front row L-R: Captain Patsy A. Fusaro, Captain Fred Armona (LODD), Robert Lenoy, Nick Ricciardi, and Joseph Mendillo In rear on apparatus are John Minardi, Leonard Saia, Patsy J. Giglio. 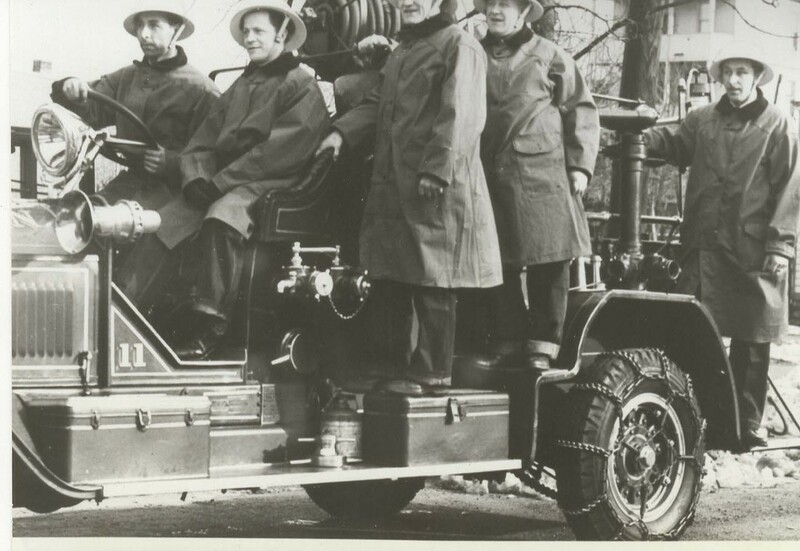 1967: Men of Engine Company 11 with 1953 Seagrave: ​ In front L-R: John Alexander, Edward W. Hunt, Captain Joseph O'Neill, Vito Tiritilli, and Captain David R. Pickels and at top George Reid and John Donohue. 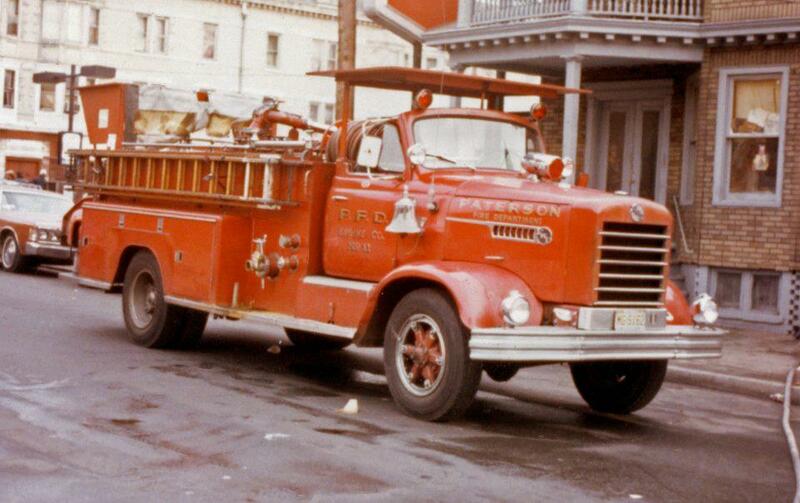 December 1, 1969: 1957 FWD Special 1000 GPM (Serial D80294) formerly used by Engine Company 1. 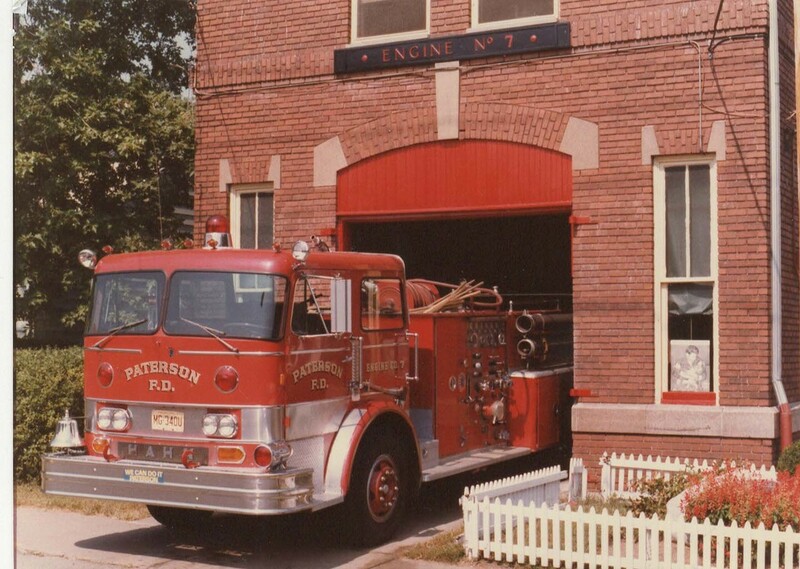 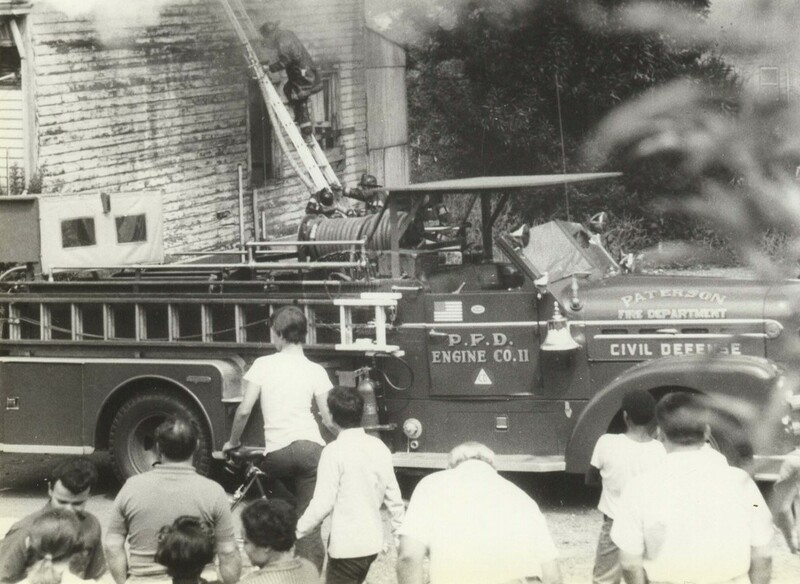 ​February 1, 1978: Company receives a 1971 Hahn 1250 GPM (Serial HC523127120) formerly used by Engine Company 1 and 6. 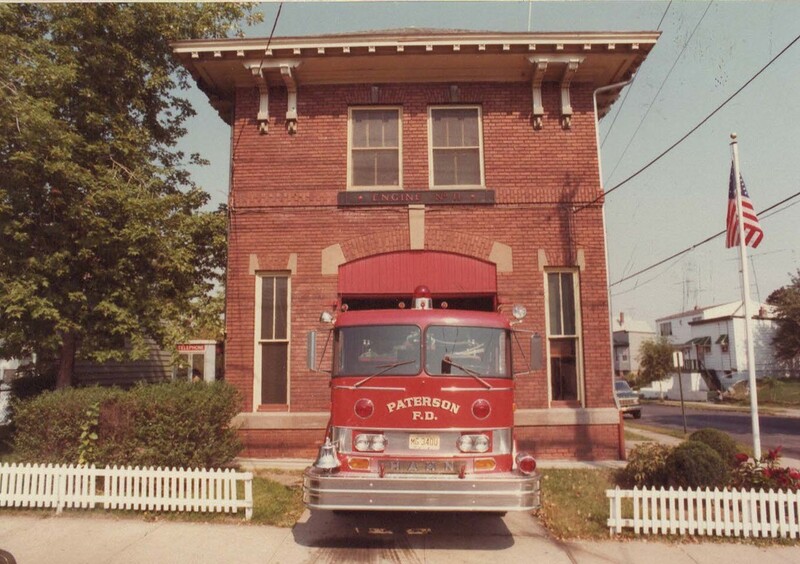 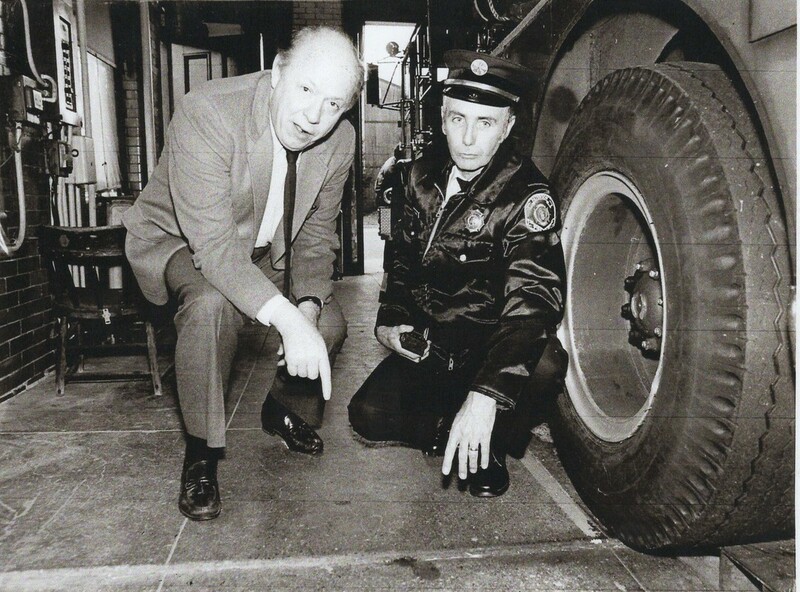 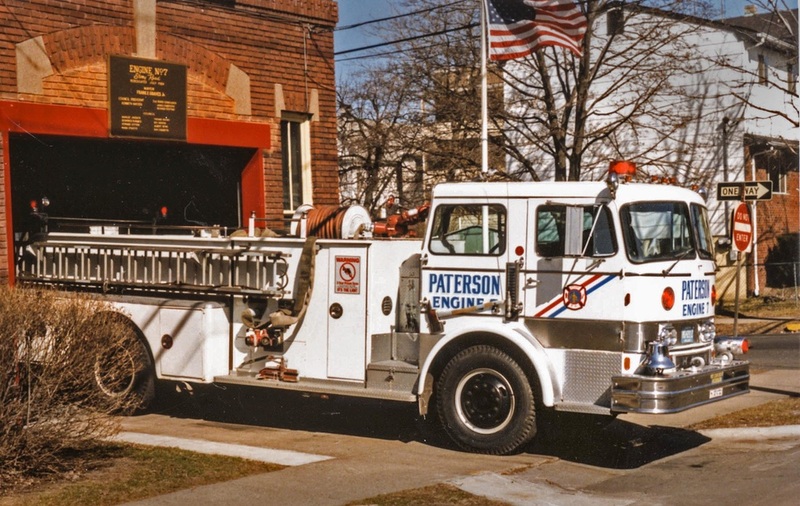 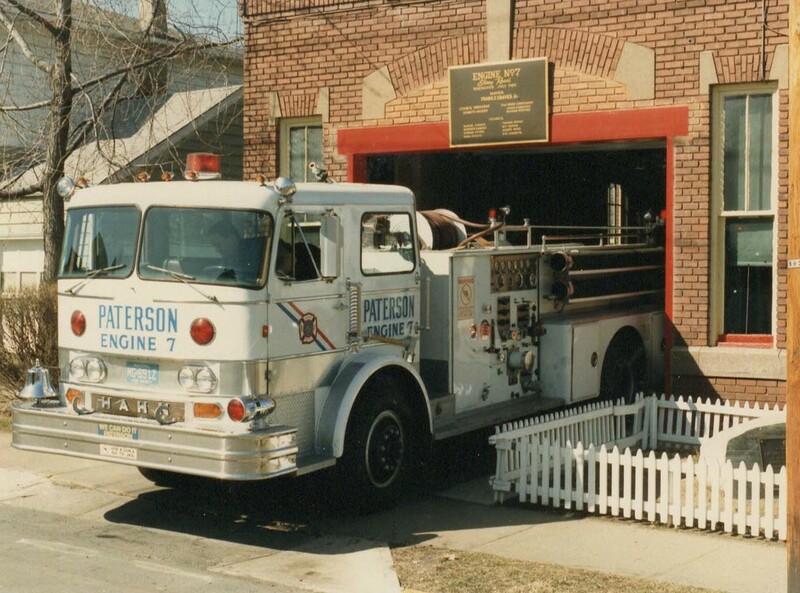 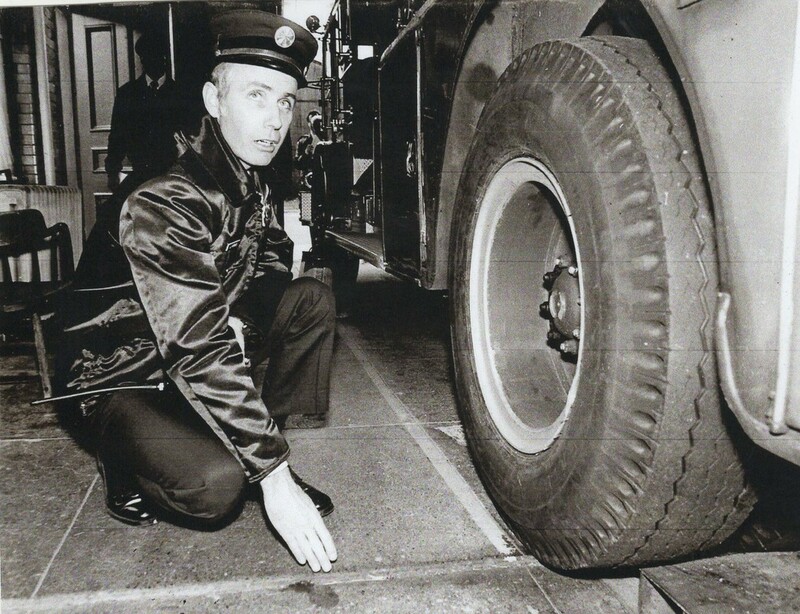 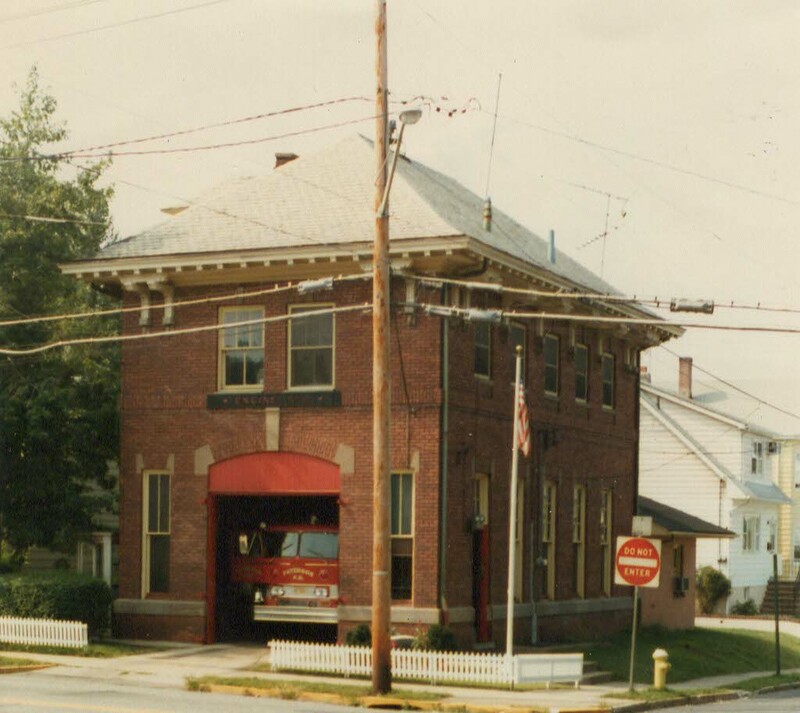 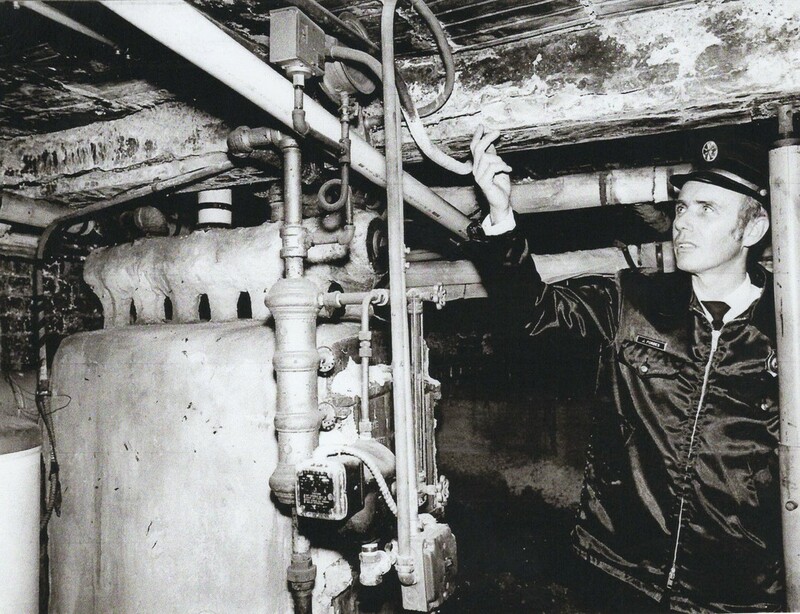 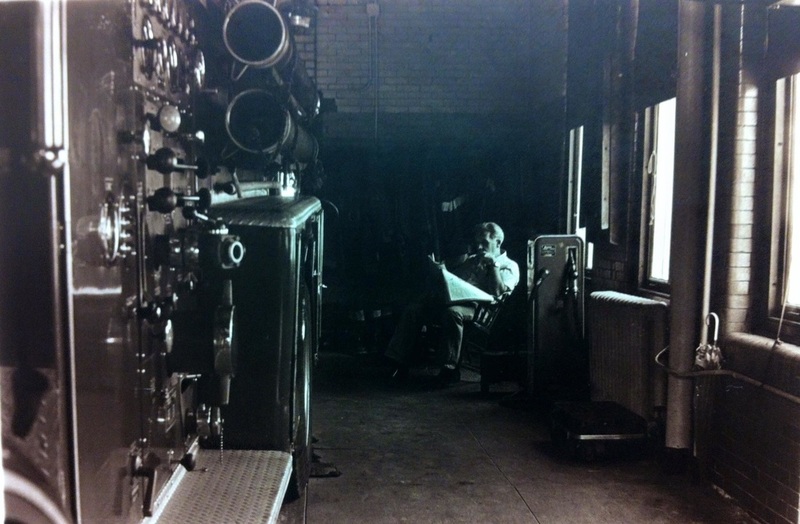 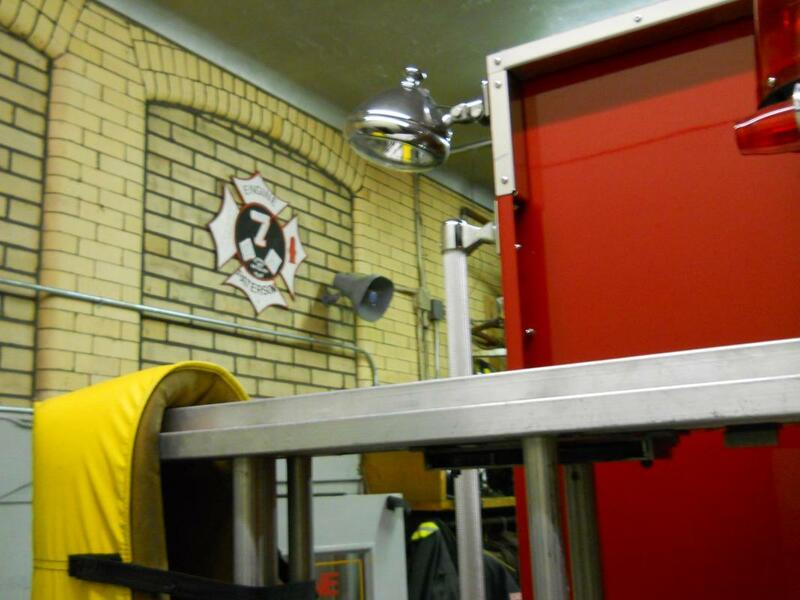 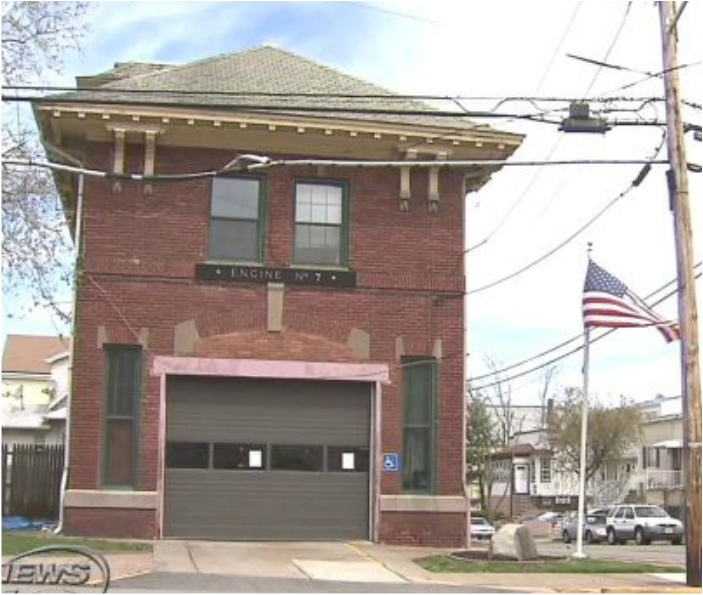 November 30, 1983: ​97 Grand Street Firehouse closed for repairs and Engine Company 7 relocates to the Hillcrest Firehouse - This came about starting with a Saturday inspection Assistant Chief Joseph Forbes discovered evidence of a floor collapse due to the weight of the Hahn Pumper. 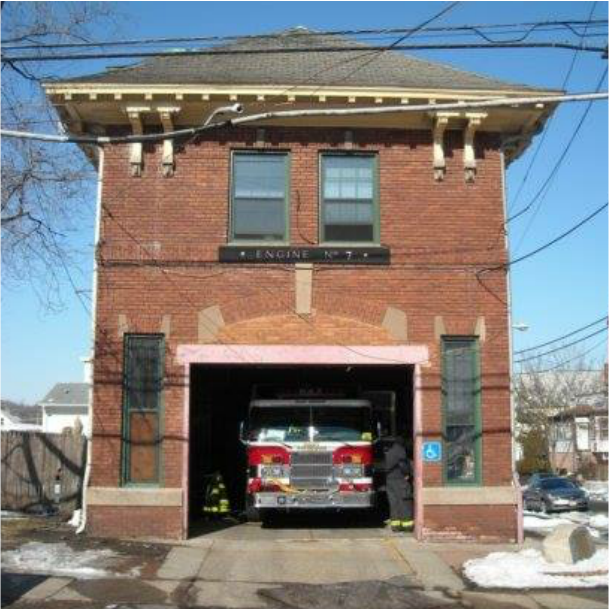 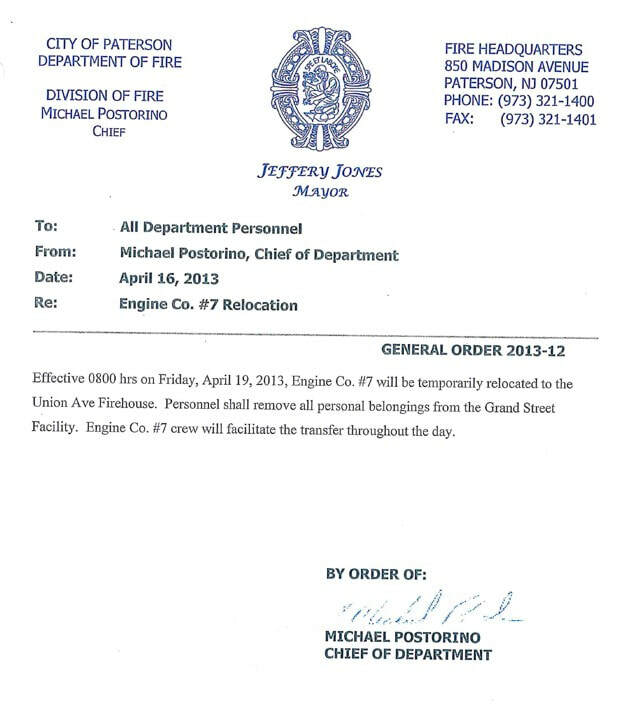 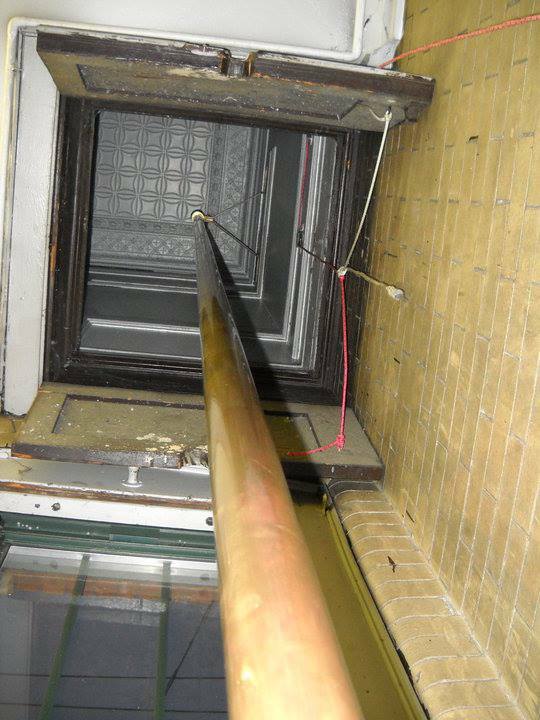 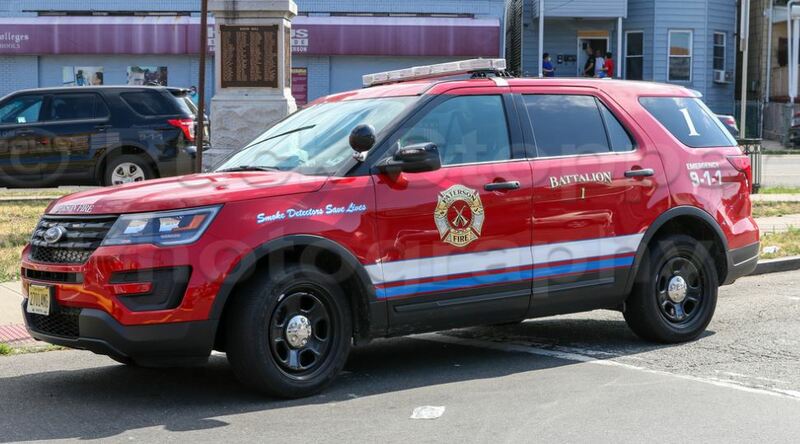 A report was sent to Chief Kane and Mayor Graves did a follow up inspection and approved the repair funds.